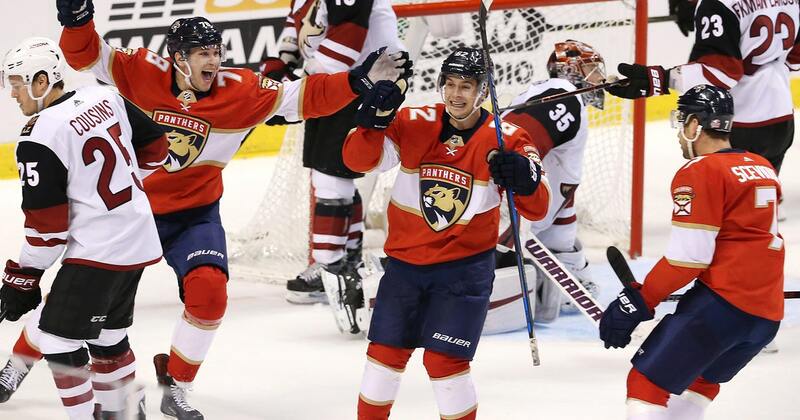 SUNRISE, Fla. (AP) —Denis Malgin snapped a tie with 3:45 left and the Florida Panthers overcame a two-goal deficit by scoring four times in the third period for a 4-2 victory over the Arizona Coyotes on Saturday night. Vincent Trocheck had two goals and an assist for the Panthers, who remained three points behind New Jersey for the final Eastern Conference playoff spot. Florida has two games in hand on the Devils. Jamie McGinn added an empty-netter with 14 seconds to play. In a matchup of backup goalies, James Reimer made 26 saves for the Panthers while starting in place of an ailing Roberto Luongo. Darcy Kuemper stopped 43 shots for Arizona. Keller scored when Panik’s shot from the right circle bounced to the rookie, who netted his 22nd goal at 14:36 of the first period for a 1-0 lead. Arizona made it 2-0 when Stepan’s shot on the power play deflected off Panik and past Reimer at 1:33. The goal was Panik’s 11th this season and third in four games. The left wing also has a five-game point streak. Trocheck put Florida on the board at 6:13 of the third when his wrister beat Kuemper to the short side. The center tied it at 2 when Mark Pysyk‘s shot deflected off the post and Trocheck reached around and tapped it in for the first 30-goal season of his career. NOTES: Arizona scratched centers Laurent Dauphin, Freddie Hamilton and Zac Rinaldo, plus defensemen Jason Demers and Niklas Hjalmarsson (lower body), who sustained a non-contact injury in Arizona’s 6-5 loss Thursday at Carolina. … D Trevor Murphy, 22, who was acquired from Nashville last month, made his NHL debut after splitting time between AHL affiliates Tucson and Milwaukee. . Florida scratched forwards Micheal Haley, Connor Brickley and Radim Vrbata, plus defenseman Ian McCoshen. . The Panthers recalled G Harri Sateri from Springfield, with Luongo sore from the recent road trip. . Florida D Aaron Ekblad, the No. 1 pick in the 2014 draft, played in his 300th game. . The Panthers honored founding owner H. Wayne Huizenga, who died on Friday. Huizenga also was the founding owner of the Florida Marlins and owned the Miami Dolphins. . Florida hosted Panther Conservation Night in an effort to raise awareness about the Florida panther, an endangered cougar that inhabits the Everglades and South Florida.